There is trouble bubbling in the millions of permafrost lakes dotting the Arctic landscape: massive amounts of carbon being released into the atmosphere and not yet factored into global greenhouse gas calculations. The methane and carbon dioxide emitted by rapid thaw of the permafrost beneath those Arctic lake beds will more than double the greenhouse gas load expected to be pumped into the atmosphere from more gradually thawing terrestrial permafrost, according to a study newly published in the journal Nature Communications. The result is an “irreversible, abrupt thaw climate feedback” that will accelerate climate change, even if society reduces human carbon emissions, the study says. The conclusion comes from more than a decade of research at hundreds of lakes in Alaska and Siberia, plus modeling work to extrapolate events at other lakes. The work was led by Katey Walter Anthony of the University of Alaska Fairbanks. 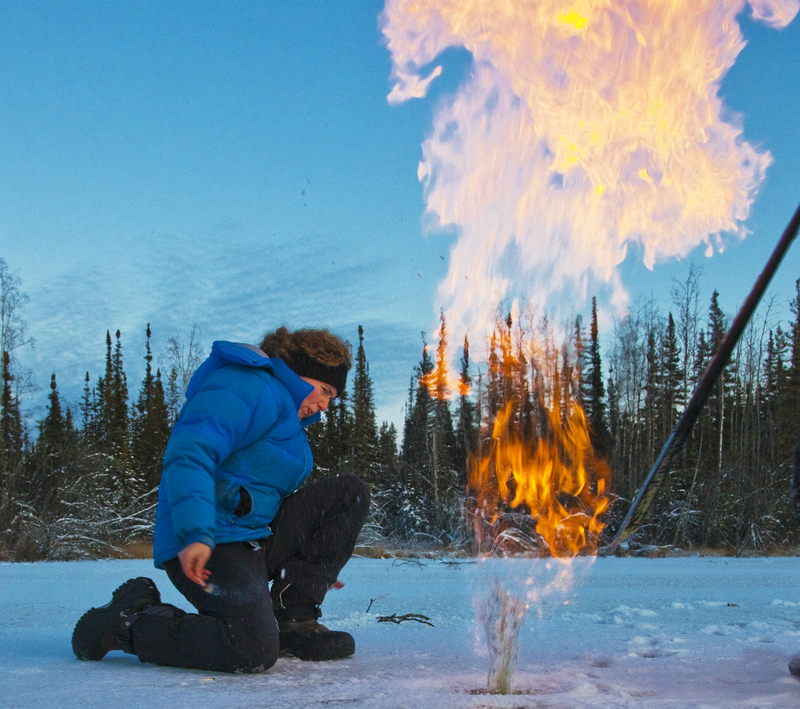 Walter Anthony, the lead author of the study, is well-known for her work tracking bubbling methane reaching the surface of iced-over lakes — and using flames to detect its presence. She said people should be aware of the lakes’ contributions to global greenhouse loads. The water bodies that are the subject of the study are “thermokarst lakes,” those formed by thaw of permafrost below the soil. Once they start to form, those lakes create a bulb of thaw beneath their beds that expands over time. As the Arctic warms, more of these lakes are appearing, and as the climate warms, those lakes grow, helping to expand the thaw below. Those lakes cover about a fifth of northern permafrost regions, according to prior research. Unlike the situation with land tundra, where plants can grow and absorb some of the released carbon from gradually thawing permafrost, the thaw beneath the thermokarst lakes is rapid and abrupt, and goes deep fairly quickly, according to the research. And unlike the situation with gradual permafrost thaw in terrestrial tundra, which is releasing mostly carbon dioxide, the “abrupt thaw” beneath thermokarst lakes is releasing mostly methane, about 30 times more potent at trapping heat. The carbon coming out of the thawing ground below the thermokarst lakes can be tens of thousands of years old, the study said. That carbon, much of which dates back to the Pleistocene age, had been sequestered by freeze but mobilized by the abrupt thaw. Walter Anthony said she believes scientists will now incorporate the expected impacts of thaw from permafrost lakes into their climate models. The lake study was funded by NASA, with help from the National Science Foundation, which allowed scientists from UAF and the Alaska Division of Geological and Geophysical Surveys to collect data from lakes in interior Alaska.